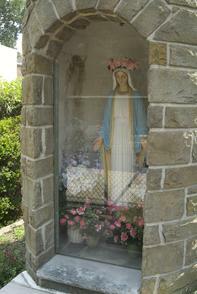 Front door of St. Stanislaus Catholic Church. St. Stanislaus is a landmark of the Polish community that existed in South Philadelphia during the height of Polish migration from about 1890-1915. 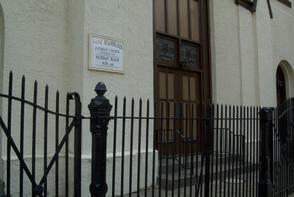 Southwark Poles petitioned the Diocese to establish their own local parish in this former Protestant church. The Polish immigrant community — many of who were living hand-to-mouth — raised the money to buy and transform the building. Named after the patron saint of Poland, St. Stanislaus Church held its first mass in 1891. 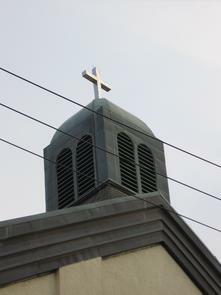 In July 2006, St. Stanislaus officially merged with St. Philip Neri parish, but the church itself remains open for a full schedule of services and retains its Polish identity. Poles arrived in larger numbers in Philadelphia after 1870, often through the Washington Avenue immigration station. Those who stayed in Philadelphia settled close to the waterfront, settling along the northern Delaware River in Fishtown and further south in this Southwark neighborhood. 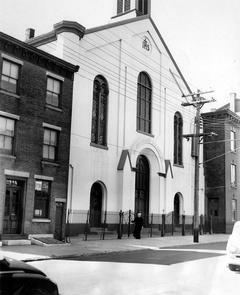 St. Laurentius (founded at Memphis and East Berks streets in Fishtown was the first Polish Catholic parish in Philadelphia (1882), but St. Alphonsus (founded 1852) at Fourth and Reed streets served South Philadelphia Catholic Poles too. 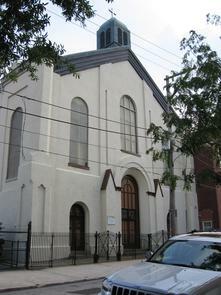 The influence of the church on the community is reflected in the Polish term for this area of South Philadelphia: "Stanislawo" meaning "from the neighborhood around St. Stanislaus Church." Polish immigrants referred to their new community as "The Miracle of Saint Stanislaus" because the success of the established neighborhood eased the way for successive waves of new arrivals. In addition to a shared language and culture, residents of Stanislawo had Polish-run stores, fraternal organizations, and a vibrant Polish church and school; all provided for the social, physical and spiritual needs of the community. The Poles who came here were primarily rural peasants, but a few had previously been migrants within Europe who moved to urban areas for work when land became scarce and unproductive. This group became more urbanized, and its members acquired industrial skills. Once in America, skilled and unskilled Poles alike created this sense of self-sufficiency via their neighborhoods. Here in Stanislawo and other parts of Philadelphia, Poles found the opportunities of a growing industrial seaport city. Rural Poles put down roots in Southwark and became urban Polish Americans. They worked in factories, machine shops and on the docks. Even as Polish Americans settled in other parts of the city and suburbs, many can trace their families and important personal milestones back to Stanislawo. Church of St. Philip Neri. Parish Information, "The Miracle of St. Stanislaus." Available at: http://churchofstphilipneri.org/stanislaus.htm. Polish American Cultural Center. "Brief History of St. Stanislaus Parish in South Philadelphia. The Tradition Continues…" Polish American Cultural Center. http://www.polishamericancenter.org/historic_st_stans.html.